If you’ve been paying any attention to the news this year, you probably know that the upcoming election is creating even more buzz than usual. Now that social media gives everyone a platform to express opinions, it seems like everybody wants to make sure the public knows where they stand on a variety of controversial topics. Here at Cornerstone we are certainly not experts in politics, but we’re pretty sure we have something you can all happily support this election season. 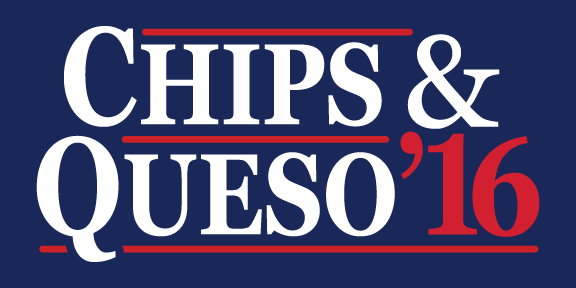 Chips & Queso ’16 shirts and decals can be purchased on our website. Shirts feature the Fuzzy’s Taco Shop logo on the back, but decals have no logo. If you have questions or would like to learn more about our products and services, shoot us an email or leave a comment below! We’d love to hear from you. Posted in current events, custom, decals, design, Fashion, Fort Worth, gifts, Screen Printing, services, Style, t-shirts, Uncategorized and tagged as 2016 election, chips & queso, Cornerstone Impressions, decals, election shirts, for president, Fort Worth, funny, shirts.